Had to share…how many of us started cooking with our mums? I don’t have my Mum any more. I can’t spoil her or give her a bunch of flowers and a hug. Sadly because of the cruelty of breast cancer, my two girls only have very distant memories of her too. What I do have however, is her handwritten recipe book. It is rammed full of sparsely noted details, vague titles such as ‘oat biscuits’, and the key to unlocking my culinary DNA. In her honour today I decided to bake a recipe that evokes my Mum more than any other for me. She used to make a fantastic chocolate cake that I still make, her pastry was always crisp and buttery but she had a serious weakness for ginger biscuits. 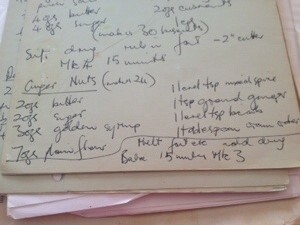 I leafed through her notes until I came across two recipes, ginger nuts and ginger snaps. I plumped for the Ginger Nuts and set to. 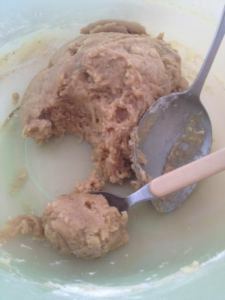 2 Responses to A tin full of Gingernuts – remembering my Mum on Mothers Day. My mum, the author of Down My Front and all round ‘Good Egg’, taught me everything I know! The Andrews skill of boshing something together out of the scrappy bits in the fridge has been passed down a generation, clearly. Actually…You’d have been proud of me Saturday – I had some pancetta, some frozen peas, half a pot of creme fraiche, a bunch of wilted mint, and a leek hanging around the fridge….crisped up the pancetta, softened the leek, cooked the peas; in it all went with the creme fraiche and a bit of butter OBVIOUSLY…on top of some spaghetti, topped with a bit of shredded mint. I was prepared for it to be weird but it was really summery and light! Do you think philadelphia would have worked instead of the C.F?